Happy Friday, Friends! Today is release day over at Ellen Hutson LLC! There's a fabulous new round of stamps and dies that are sure to please the any-occasion cardmaker or scrapbooker alike! Please meet Everyday Doodles and Everyday Punnies by Julie Ebersole for Essentials by Ellen! These are the sweetest images and funniest sentiments . . . I couldn't resist making a set of notecards using all of the Everyday Doodles images! This notecard set was die cut using Catherine Pooler's Nested Label Dies cut from 110 Lb. Neenah Solar White cardstock. I used Catherine Pooler's awesome Mini Ink Pad Bundle to stamp the images in all of the different ink colors. Colorful striped accents were made by inking the new Painted Stripes stamp in different colors (that task is made easier with these mini ink pads! ), then cutting the stamped stripe image into thirds. The Everyday Doodles images were die cut with their coordinating Everyday Doodles Dies, then matched up with their coordinating Everyday Punnies sentiments and popped up with foam tape. Now I have a great selection of adorable notecards on hand to pop into a loved one's backpack, suitcase or briefcase, or send off to cheer up someone's day! You can find the new Essentials by Ellen April Release exclusively at Ellen Hutson LLC. Thanks so much for joining me today . . . I hope you have a lovely weekend! I think these products would be a fun alternative to a larger letterboard because you can make cute, more "permanent" pieces of framed artwork, to send through the mail or hand to a friend or family member! This great Letterboard background and frame (two separate dies), includes the small alphabet die set that also has a bunch of fun symbols and emoticons! The Letterboard background was cut from Ellen's Ebony Black cardstock and the frame from gold metallic cardstock. I also used the Letterboard Larger Alpha Die set for the "EVER" word, and Letterboard Script 2 for the "you" and "favorite" words. All of the words were die cut from Neenah #110 Solar White cardstock, then colored in an ombre effect with Copic BG Markers. Your friends for applying all of the letters and words to the Letterboard background are either a Jewel Picker or tweezers, and Matte Multi Medium. I also used Julie's previously released Mondo Hydrangea for the cute little bloom accent. It was stamped in Memento Tuxedo Black ink onto Neenah #110 Solar White cardstock and colored with the same RV Copic Markers as the adorable hearts from the Letterboard die set. The center of the bloom is accented with Nuvo Bright Gold Crystal Drops. All the new dies I used on this card (plus an additional Letterboard Script 1 die set) are being offered in a bundle with savings for you in the Letterboard Die Combo! To finish the card, I mounted the Letterboard to a watercolor cardstock card base that I flicked with Kuretake Gansai Tambi gold watercolor. You can find all of the new December Essentials by Ellen in the shop HERE, starting NOW! Just click the graphic above to head over to the store -- that's one heckova great deal!! Be still my heart! Julie's mondo florals never cease to capture my heart! I colored this gorgeous floral image with another of my (newest!) loves . . . the AMAZING brand new Daniel Smith Watercolor Half Pan Sets Ellen started carrying in the shop recently -- I haven't been able to put them down! I can only describe them as soft & buttery -- they reactivate with your watercolor brush SO very easily and can easily be worked and re-worked after they are on your paper. They are simply amazing!! After gold heat embossing the floral images, I watercolored them. Shown below are the colors I used - Quinacridone Rose from the Ultimate Mixing set (top left), and (lower left) Serpentine Geniune. Shown on the lower right below is Myan Blue Genuine from my PrimaTek set that I panned and mixed into the Blues set case. The Ultimate Mixing set is a great deal -- in addition to the 15 pan colors in the set and their great little case that makes them perfect for travel, you receive an ADDITIONAL empty 15-pan case that you can fill with any additional tube paints you'd like! I wanted to keep the beautiful watercolored flowers the main focus of this card, so I just mounted the colored image with foam tape to a card base with a 1/2-inch piece of gold metallic cardstock along the left side. 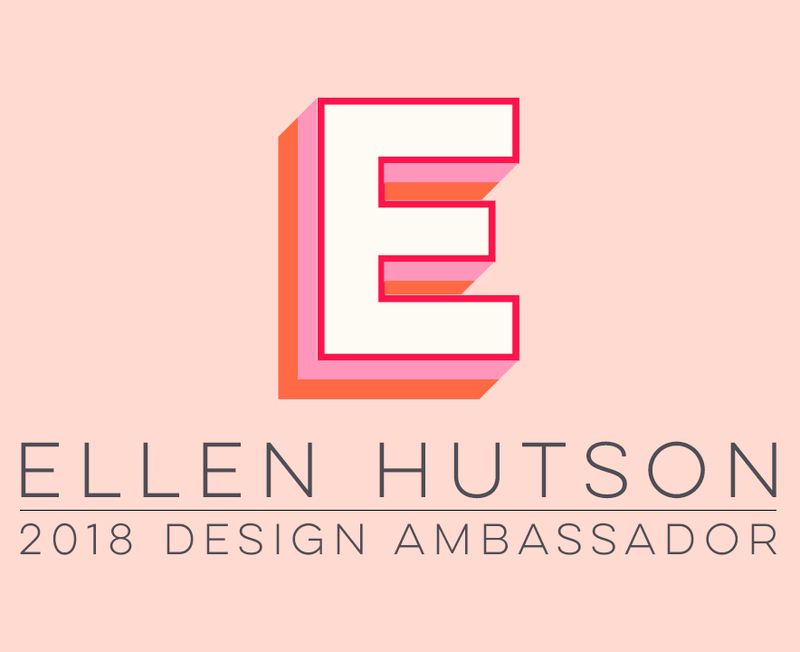 Be sure to head over to Ellen's The CLASSroom blog to see all the wonderful inspiration the other designers have for you today! I hope you are enjoying your long holiday weekend! It's finally time ... the newest November Essentials by Ellen stamps and dies are now available in Ellen's shop and you can find them all HERE! As you can see, this adorable die set is great for many other types of projects besides the fabulous intended use of a pop-up mitten element (genius!) -- I absolutely love the three different sizes of pretty snowflakes as well! I also die cut the snowflakes from the Pop-Up Mittens die set from white felt and stitched them on the mitten fronts first, using embroidery floss. Then I stitched each pair of mittens together using a regular stitch or a blanket stitch, leaving them open at the top so they can hold goodies! Next, I stitched all of the mittens together using some silver sparkle cord so they can be hung like a banner! I'm thinking this will make a cute decoration for my oldest's dorm room! You can find the entire new November Essentials by Ellen release in Ellen's shop here. Happy creating!